48 ROLLS/PALLET, special freight available. 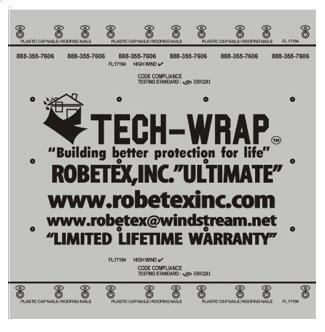 DESCRIPTION: Tech-Wrap UL ULTIMATE, 100% Polypropylene synthetic underlayment offers offers a strong, secure, and safe alternative to conventional roof underlayments. Gray/Black Color (Gray Face). Replaces 30# felt. Suitable for all pitches/slopes. Use under asphalt shingles, metal, slate, clay tile or concrete tile.